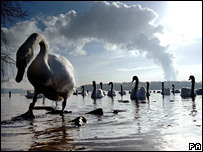 Britain's containment measures are being subjected to their first test, after a swan found dead in Scotland proved positive for the H5N1 strain. The message from animal health experts is loud and clear: Britain will need to stamp out any outbreaks of disease as quickly as possible. A raft of measures has been put into place to limit the chance of bird flu entering the country. But the government will not want to repeat the mistakes made during the foot-and-mouth crisis five years ago. "With such a contagious infection as avian flu, the sooner we can contain it the better chance we have of stopping the infection in its tracks," explained Dr John McCauley, of the Institute of Animal Health. He added that increased surveillance of domestic and wild birds was extremely important because the sooner you could spot the disease the faster you could act. Avian flu is spread between birds by contact with saliva, nasal secretions and, in particular, faeces; directly or through contaminated objects, clothes or vehicles. It can also pass from bird to human, but cases of this are rare and transmission requires very close contact to the animal, making poultry workers and vets most at risk. The virus is able to move swiftly through flocks of domestic poultry. Because of this, the contingency plans centre on limiting contact between separate poultry flocks, and also, importantly, between poultry flocks and wild birds, such as ducks, swans and geese. "We need to do the best we can in terms of keeping the disease out of the poultry industry; and that requires really early detection of the disease in wild birds and stopping wild birds getting into contact with poultry," Dr Andy Evans, of the Royal Society for the Protection of Birds (RSPB), told the BBC News website. And because it is impossible to control the movements of wild birds, emergency efforts will focus on domestic poultry. A chain of events is set off by the discovery of a wild or domestic bird with avian flu. Temporary measures would include bringing all domestic poultry inside, where possible, and a short-term ban on the movement of all poultry and hatching eggs while an initial outbreak in poultry or wild birds is investigated. Dr Bob McCracken, president of the British Veterinary Association, said that it was also important to make sure domestic poultry used mains or treated water, and were not sharing water sources with wild birds. "Spread of infection is largely going to be through contaminated boots, equipment and possibly water - and hopefully no-one is using pond or lake water where wild birds come into," he said. Around the infected premises or an infected wild bird, protection zones of at least a 3km radius, lasting a minimum of 21 days, and surveillance zones of at least a 10km radius, for no less than 30 days, would be established. Within these zones there would be no movement of poultry (expect for immediate slaughter), carcasses or eggs; bird fairs, shows and markets would be banned; and used litter and poultry manure could not be moved. However, birds would be allowed to be transported non-stop through these areas by a major highway or railway. Dr McCracken emphasised the degree of cooperation from poultry farmers that would be required. "If we had one rogue poultry keeper out there not doing their job properly, and I like to think that there wouldn't be, then instead of one outbreak we could have several," he said. "But I like to think that that would not occur and one of the most encouraging things I have found is the very positive attitude within the poultry industry." 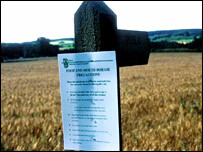 Peter Bradnock, chief executive of the British Poultry Council, added communication during an outbreak would be vital. "I think the key here will be the degree of communication between the central offices to the districts and vice versa," he explained. "We have been encouraging all of our members to get to know the veterinary officers in their regions, and they have been doing that." The animal health experts also pointed out the differences between the current plans for avian flu and the foot-and-mouth outbreak in 2001. "I think because we have had foot-and-mouth, we are probably better prepared than we would have been had we not had foot-and-mouth. Our deficiencies were highlighted in 2001 and lessons have been learnt," said Dr McCauley. They also explained that avian flu was not a wind-borne virus, unlike foot-and-mouth, and there would be less chance of it moving swiftly from farm to farm like during the 2001 foot-and-mouth outbreak. "It will be the movement of infected wild birds, not domestic poultry, that will determine how many outbreaks there will be and where they will be," Dr McCracken said. And unlike the foot-and-mouth crisis, the countryside will not be "closed down"; in fact the Department for Environment, Food and Rural Affairs has said that it looks like it could have little impact on the lives of people living within the zoned areas, unless they own poultry. Dr Evans added that he felt optimistic about controlling the flu virus: "The risk to human health is low, so the public should not panic." People in towns not affected unless they keep poultry.